From the Baldwin County Courthouse, go east on Hancock St. and follow Highway 22 (Sparta Hwy) east for 2 miles. Turn left on Lake Laurel Rd. After 3 miles turn left on Jule Ingram Rd. Go 0.3 mile. On your left will be a gate with a woods road going up a hill. 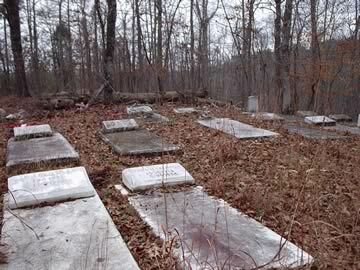 Walk up the woods road for 150 feet to the cemetery on the top of the hill. At least 6 graves but could be more than 20 graves in this area. Handwritten on slab. Dates and first name very difficult to read. Dates unreadable. First name questionable.